D.C is recovering from riots after one player blew the D.C. Federals'chance at the World Series, and Lt Sam Holland is determined to unravel the twisted web of motives behind the star centre fielder's death. Was it a disgruntled fan, a spurned lover or a furious teammate? While Sam digs through the clues her husband, U.S. Senator Nick Cappuano, fights for his political life in the final days of his reelection campaign as financial irregularities threaten his future. 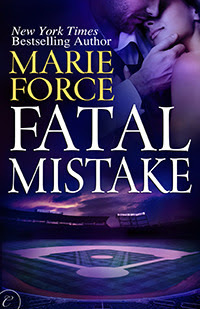 Its a distraction Nick can ill afford with Sam in the middle of a high profile murder investigation and both of them trying to help their adopted son Scotty, cope with the murder of a ball player he admired. I read the first five in this series straight, one after another, but had to wait for this one! It did take me a little while to re-orient myself into the characters, but once I got going I enjoyed another great story by Marie Force. For some reason I really like this series. I like her other series, but don't rush to read them when they are published. This series though is different. I pre-order! I have come to love the variety of characters. Sam and Nick are adorable together and Scotty their adopted son has added another fun dimension and some challenges for both Nick and Sam as they adapt to their new role. One laugh out loud moment was with Nick and Scotty when Scotty is trying to fathom out some school yard chat, and Nick has to negotiate it delicately. As always the police that work with Sam are another hook into the book. There was no story line involving any of them this time although Hill the FBI agent continues to 'develop' a relationship with Sam. After the last book, fans were horrified at Hill's appearance, but Marie Force has it all in hand! There is murder to solve, as I was reading I began to think of the In Death series by Nora Roberts. In truth these series are quite different, the Fatal series is more of a 'cosy suspense' The death details are usually not too gruesome, and the hard edge while there, is on the lower end of a continuum. There is enough at the end of the book to make me want to read the next in the ongoing saga of these people. What is going to happen to Sam's dad will certainly make me want to keep reading. Looking forward to March 2014. Check out the series on Goodreads.